Casa Verde has been mentioned in the Independent for 14th July. Have a look and see……. Lost in Spain and yet just over an hour from Faro airport. Fancy some down time in a part of real Spain? We have one week available from Saturday 18th July through to Saturday 25th July and two weeks starting 30th August. The rental is £700.00 per week. We also have three weeks available from the 9th October following a cancellation. These weeks are at £600.00 per week. Try us, we think you’ll be pleased with what you find………..
Lovely Casa Verde in Spain, just over an hour from Faro airport, available for 2 weeks of sunshine 19th June to 3rd July – this is a place to chill out at………..
Fado Night at the Nautical Centre in Alcoutim, Saturday 28th March. 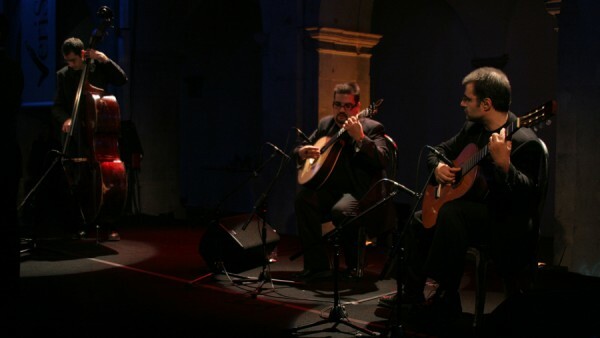 Traditional Portuguese music dating back to before the 1820’s. Stay at Casa Verde in Sanlucar and enjoy! 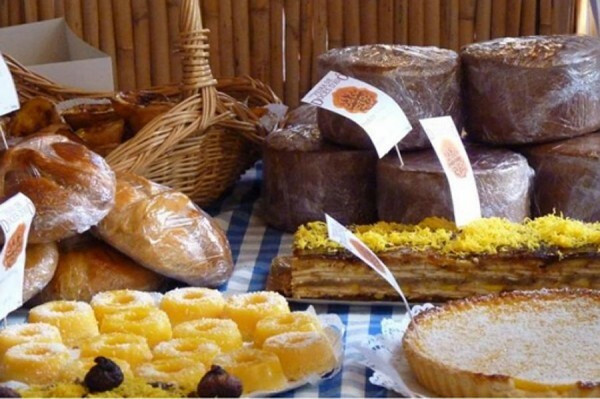 The 7th Gastronomic Fiesta will be held March 7th and 8th in El Almendro, just 10 minutes from Casa Verde. A great place to taste the white truffle and other Spanish delicacies…….. Fancy a Valentine’s break from the cold? Try Casa Verde for some authentic Spanish charm. A 3 night stay over 14 February is just £180.00 on late availability…………. Fancy a break from the cold? Lovely Andalucia is 18C this weekend. Try Casa Verde for some authentic Spanish charm! Easter weekend has it all! 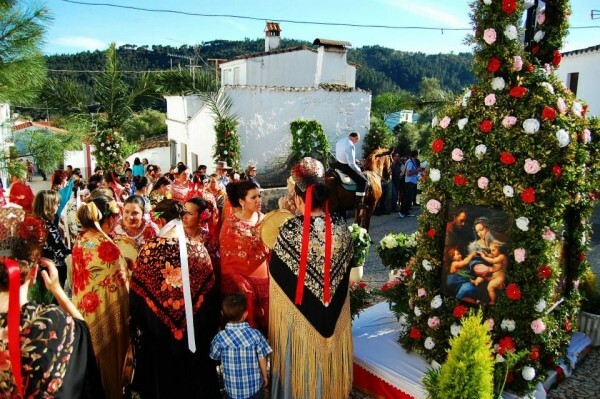 The combination of Alcoutim in Portugal and Sanlucar de Guadiana in Spain, means there’s a lot going on over the Easter weekend. The sardine barbeque for the whole village in Sanlucar and the Feira de Doces d’Avó in Alcoutim – delicious local sweet treats, and live bands and processions, ensures there is never a dull moment. We have a very special offer which expires at the end of November. 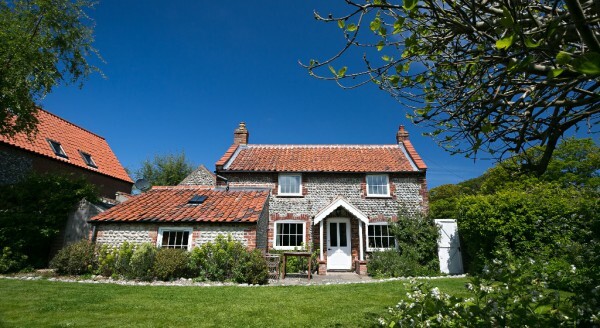 Book any dates you fancy, so long as it is available, for a break in January or February or up to 27th March 2015 at any of the five cottages that we have in North Norfolk, Highlands of Scotland and southern Spain. Casa Verde (up to 7 guests) – £60.00 per night for 3 or more nights. 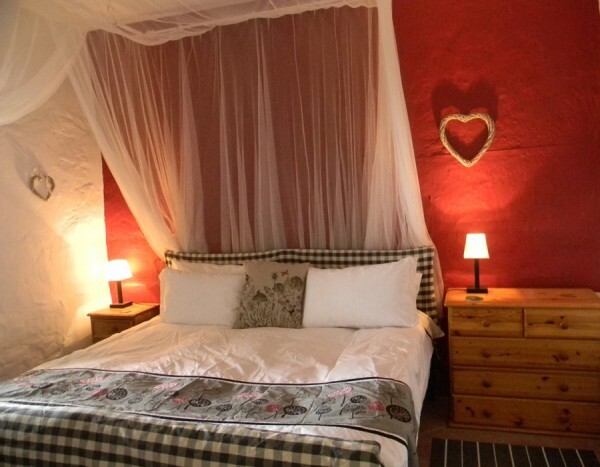 Kathleen’s Croft (up to 6 guests) – £60.00 per night for 3 or more nights. Beachcomber Cottage (up to 6 guests) – £80.00 per night for 3 or more nights. Plus our usual returnable damages and breakages deposit of £100.00. See www.welcomeescapes.co.uk for further information and photos. 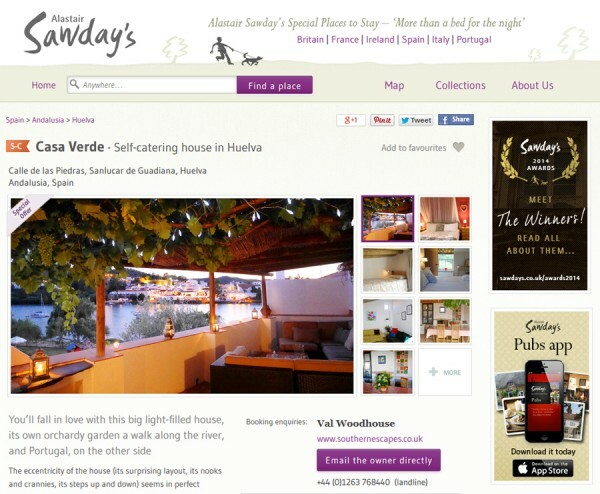 Casa Verde has just been nominated to be included in Alastair Sawday’s Special Places to Stay: Spain, and we are thrilled! 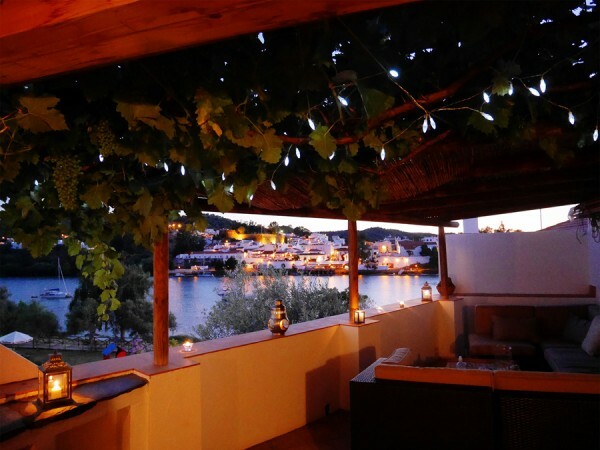 Situated in a charming white painted village on the Rio Guadiana in Spain, and with views to a matching ‘twin’ village of Alcoutim in Portugal, this lovely ‘casa’ is just the place to chill and watch the boats go by……….. When we arrived at Casa Verde in the darkness of night we were absolutely amazed at just how lovely Casa Verde is despite having seen the pictures on your website actually being there was the wow factor impact and the quirky element. When we woke up the following morning the views from Casa Verde were brilliant, looking across the river Guardiana with the beautiful Portuguese small town Alcoutim sitting there with the castle up on the hills and when you go across to Alcoutim and look back to Sanlucar de Guardiana it is almost a mirror image – absolutely beautiful. 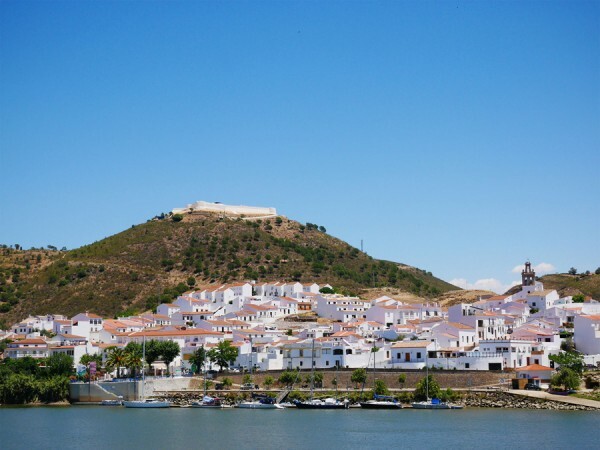 We had a great time at Casa Verde and thoroughly enjoyed visiting places like Mertola, Ayamonte, Playa de Isla Canela (lovely beach) and of course Alcoutim where there is a lovely river beach and an excellent bar/restuarant alongside. Also we would highly recommend Braseria El Llano (excellent food) in Sanlucar de Guardiana. Dear Val, I had to write to you tell you what a marvellous week we had in your ‘Casa Verde’ home! What a beautiful house with wonderful touches and enchanting rooms! We arrived late on a Friday evening ( your car hire and road route advice were perfect) and we crept into the house and suddenly we felt like we were exploring a treasure trove – steps down to more rooms, steps up to more bedrooms and terraces. Every room was a discovery. We were so comfortable. Jak had fetched in all the provisions we had asked for – and more besides. We just had to sit down immediately and gaze across the river into another country, taking in the lights and the glistening water of the river. We took up Jak’s offer of a trip down the river on a long and lazy afternoon eating at a Portuguese restaurant about two hours downstream. We had superb weather every day, waking each morning to blue skies that lasted until sunset. It couldn’t have been better. Casa Verde is the most wonderful place! The location in Sanlucar de Guadiana is very special with stunning views over the river to Alcoutim in Portugal. The house itself is gorgeous, a quirky but authentic layout with surprises round every corner, whether it’s the stunning views from the 3 terraces or the wonderful decor – a testament to Val’s interior design skills and eye for detail. Every amenity and gadget is there – one of our favourites was the juicer to make fresh orange juice for breakfast. The bed was huge and comfortable and there was plenty of hot water thanks to the solar panel on the roof – and that was in December! Just wanted to thank you again for our lovely stay at Casa Verde - it's a fabulous house, with a wonderful aspect over the river to Alcoutim. I could spend so many hours relaxing on that terrace if I had the chance! Thank you again for letting us stay at Casa Verde." What an interesting 'real Spanish' experience. A lovely well equipped Casa in a pretty white village with water views. You've done a great job fitting this out. Thanks for sharing it." Thank you for a lovely relaxing stay once again. Feels like coming home and we were very lucky with the weather. Ventured over to the finca - a lovely walk, and also to the castle. Sadly this was closed but amazing views. See you next year"
If you are looking for a quiet corner of the real Spain then look no further. Casa Verde is a charming and well appointed little house in this equally charming white village where time stands still and everyone is friendly. Take to the river, enjoy walks, hikes or biking or just relax. A best kept secret for sailing folk who come and anchor their boats for a week or a month... but some never leave, and its easy to see why; the perfect antidote to the rat-race or Costa-Bling."